were developed as the result of twenty years of laboratory experience and involved the systematic elimination of the imperfections found in other peristaltic pumps on the market. 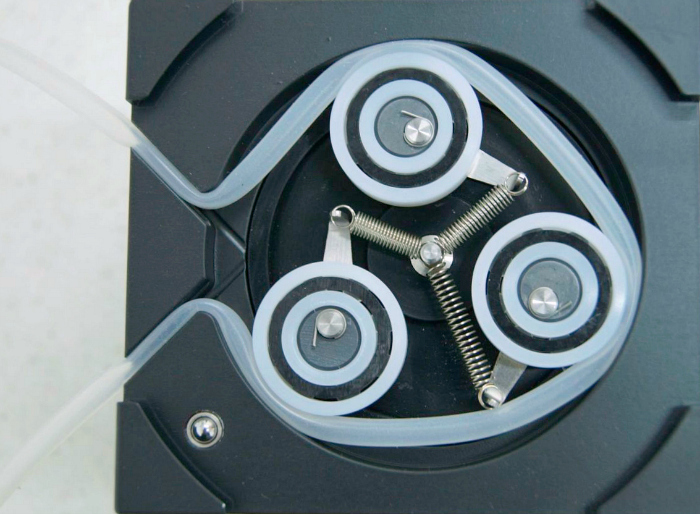 The special mechanics of LAMBDA peristaltic pumps has been developed because no pump can be used for continuous fermentation experiment lasting up to eight weeks. The peristaltic pumps can be used together with laboratory fermenters, bioreactors, fraction collectors, autosamplers and other lab equipment. LAMBDA peristaltic pump can be connected to the process control software (PCS) or to PC/laptop via RS-485 interface or RS-232 interface. 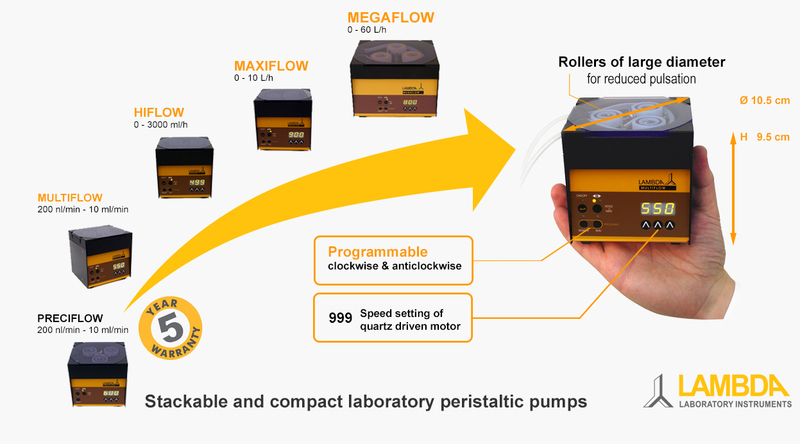 The unique flow integrator LAMBDA INTEGRATOR makes the LAMBDA peristaltic pumps excellent for the use in automatically controlled systems e.g. fermentation, bio cultures, chemical synthesis, fraction collection, etc. Problems with the traditional peristaltic pumps are solved! During the development of the new LAMBDA peristaltic pump mechanics all aspects of existing peristaltic pumps have been analyzed and finally an efficient solution has been found. What makes LAMBDA laboratory pumps so efficient? Rollers of small diameter apply a high strain onto the tubing and push the tubing in the direction of the sense of rotation. Therefore, the tubing has to be fitted with stoppers. We use rollers of very large diameter – this leads to the elimination of such strains and prevents tubing motion. A larger portion of tubing is compressed with better pressure distribution. The elasticity of the tubing is protected. Instead of rollers we use special plastic ball bearings with glass beads. The gliding of such rollers requires only a minimal force and the corrosion resistance in the case of spill is excellent. A special off-centre lever using a spring of non-corrosive material applies the compression force on the tubing softly and gradually. The final pressure of the liquid is reduced by the spring to 0.1–0.2 MPa (according to the tubing used). The pressure does not increase even when the line is blocked. The stepping motor or BLDC motor, driven by quartz-controlled electronics, assures a high precision of the flow rate. The ratio of speed control is 1:1000. The laboratory space is very expensive, therefore we have made our peristaltic pumps as compact as possible (all have just 1 l of volume). They are several times smaller than other peristaltic pumps on the market and therefore, so handy in use. Even without any fixation the tubing will not move at all in or out of the head. Since the lateral forces on the tubing have been eliminated, no stoppers are required. Tubing life increases considerably and flow rates remain constant, since the tubing compression is kept in the range of elasticity of the tubing. The tubing economy is very important. Low cost tubing can be used with good results. LAMBDA PRECIFLOW peristaltic pump will be paid back after consumption of about 80 m of tubing.